This flavorful dish is inspired by the mountainous region of Abruzzo, where you will find an abundance of porcini mushrooms. The recipe was developed, and written by Mario Batali. I have followed his method, and prepared it many times in my kitchen. He recommends using Farfalle, a pasta shape, commonly known as bow-ties, but it literally means, butterflies in Italian. 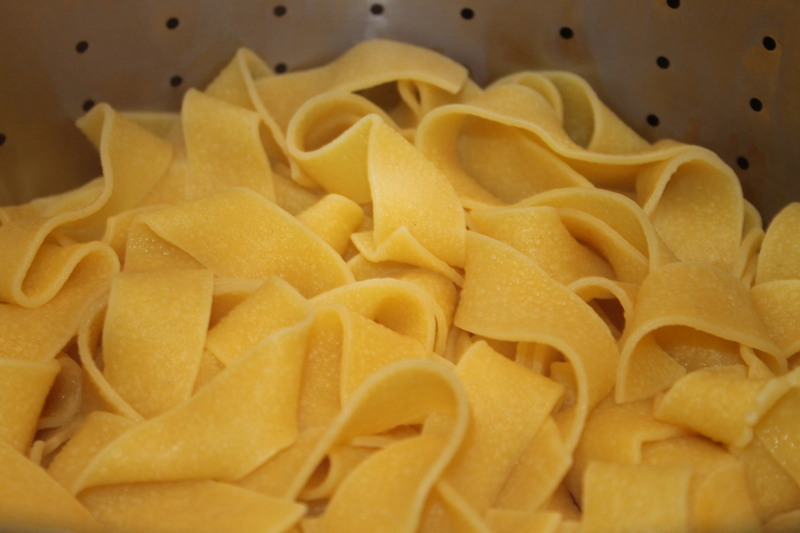 You can also use other short pastas, such as Rotini, corkscrew-shaped as shown on my featured image. They both work well, and absorb the sauce nicely. It’s always a big hit in my kitchen, and perfect for feeding a small crowd. The name of the original recipe is: Farfalle Abruzzese With Veal, Porcini and Spinach. Mario brilliantly combines veal, double concentrated tomato paste, and porcini mushrooms to create this culinary masterpiece. Make sure you caramelize the tomato paste to get a rust color, and the result will be a stupendous rustic dish packed with layers of deep flavors. Make it for a dinner party, and your guests will think that the sauce has simmered for hours. 1. Drain the porcini, reserving the soaking liquid, and coarsely chop the porcini. Strain the soaking liquid through a fine-mesh sieve, and set it aside. 2. In a large skillet, heat the olive oil over medium-high heat. Add the garlic and cook until it is lightly toasted. Add the veal and the chopped porcini, and cook, stirring, over medium-high heat until the meat is well browned, about 10 minutes. Season with salt and pepper to taste, and add the tomato paste. Cook over high heat, stirring constantly, until the paste turns a rust color, 5 minutes. Then add the wine and 1 cup of the strained porcini soaking liquid, and cook for 5 minutes, until the wine has almost completely evaporated. Add the tomato sauce and reduce the heat to a very low simmer. 3. Bring 8 quarts of water to a boil in a large spaghetti pot, and add 2 tablespoons salt. 4. Drop the farfalle into the water and cook for 1 minute less than the package instructions indicate. Just before the pasta is done, carefully ladle ¼ cup of the cooking water into the veal mixture. Stir the baby spinach into the veal mixture. 5. Drain the pasta in a colander, and add it to the veal mixture. Toss over medium heat for about 30 seconds, until the pasta is nicely coated. Pour into a warmed serving bowl and serve immediately, with the grated pecorino on the side. My wine suggestion: Montepulciano d’Abruzzo, a delightful red wine from the Abruzzo region of Italy. Another year has gone by, but all in all, it’s been a good one for me. This past summer, I made my entrance into the blogging world, and it’s been a fun journey. I would like to dedicate this blogpost to my dear friend Anna who lives in Sicily. She has been a great source of inspiration in my life, and I am glad to call her, friend. She is a gastronome and enjoys good food. In my family we live to eat and we are constantly looking for new ideas to satisfy our palates. 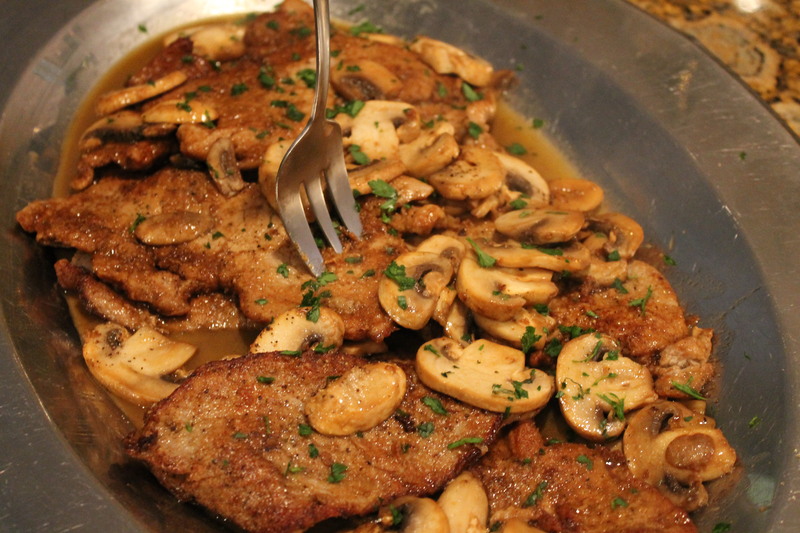 One of the dishes that is part of my repertoire is Veal Marsala. It is so easy and scrumptious, and you can certainly substitute the veal for chicken. Marsala is a city in beautiful Sicily, where this wonderful wine is produced. There are two kinds, one is sweet, normally used in desserts, and the other one is on the dry side, and recommended for savory dishes. I am so pleased to share my recipe with all of you. By now, you should know that I cook for a crowd, but most of my recipes can easily be divided in half to accommodate smaller crowds. 1) Season veal with salt and pepper. Drench in flour and remove all excess. On Medium-high heat, add 2 tbsp. oil and 1 tbsp. butter, pan fry veal for 2 minutes on one side and 1 minute on the other side. Do not overcook as it can get chewy. Remove from pan and set aside. You will repeat this process in two other batches. If the bottom of the pan is dirty, clean it before using it again. 2) In the same pan, add 2 tbsp. of butter and sauté the mushrooms. Deglaze with the wine. Put the veal back in the pan and simmer for a couple of minutes. If you need more gravy, simply add a little pasta water. Serve with your favorite pasta shape. This is a delicious dish and very simple to follow. I hope you will give it a try in your kitchen, because your loved ones will savor every bite, and ask for more. Wishing all of you a Wonderful & Healthy New Year, and lots of Happy Cooking! Cheers, and Bon Appetit from Gina’s Kitchen! A few weeks ago, hubby asked me to cook for his golfing buddies, since they were playing near the house. I gracefully agreed, and decided to make some veal meatballs over spaghetti. When cooking for a hungry crowd, pasta is always a good idea. I could have easily made a meat sauce, but I decided to get a little fancy, and made meatballs with Pecorino cheese. These delicious meatballs were inspired by D’Angelo Pizza and Wine Bar, but I created my version. This recipe can easily be divided in half. I am sharing it with you, because I was cooking for a crowd and needed a lot sauce. Normally, I recommend using a marinara sauce for these meatballs, as veal is a more delicate meat, and they can easily fall apart if don’t watch them carefully. In general, marinara is much quicker, where the standard sauce is a slow cooking process. Do not use the sausage in the marinara, as it will crowd the sauce too much. The veal by itself will make a nice appetizer to serve at a party, and will wow your guests. You can also serve them with a side of ricotta cheese. As you can see, there are many variations to this dish. 1) First, prepare the meatballs. In a large bowl, place the ground veal, breadcrumbs, 6 oz of grated cheese, milk, garlic, onion, seasonings, parsley and eggs. Combine all the ingredients and mix well with your hands. If you are a beginner cook, I suggest you use an ice cream scoop with handles to form your meatballs. Place them on a greased pan, and bake in a 350 degree oven for 10 – 12 minutes. Turn them halfway through, to get color on both sides. Remove and set aside. You can certainly pan-fry them also, but it would take a little more work. There is no need to fully cook them as they will continue to cook in the sauce. Yields about 25-26 meatballs using the ice cream scoop. 1) In a large pot, over med-high heat, add 2 tbsp. olive oil, and brown the sausages (whole) on both sides. You will do this in batches. Next, cut the sausage links in 3 pieces each. Set aside. 2) In the same pot, add more olive oil to brown the tomato paste. Cook and stir, until you get a nice caramelization, add the chopped tomatoes, the prepared sauce, the seasonings, sugar and the water. Bring to a boil, then lower the heat. Add the meatballs and the sausage in the sauce. Simmer covered for 2 – 2.5 hours, while stirring FREQUENTLY to avoid burning on the bottom of the pot. Always taste for flavor and adjust seasoning as needed. 3) When sauce is nearly done, boil the water for the spaghetti and cook according to package directions. *This is not my typical sauce, because I was cooking for a large crowd, it was convenient for me to use that large can of prepared sauce, which can be found at Italian specialty stores. I occasionally change the brand in the quest for a perfect sauce. 1 – 2 28 oz can crushed tomatoes, San Marzano is ideal as they are known for their sweetness, but they will cost you a bit more. Heat olive oil in med-sized pan, and saute’ the garlic. As soon, as they release their aromas, deglaze with wine, add tomatoes, water, seasonings and simmer covered for about 20-30 minutes. Stir occasionally. This marinara is enough for about 1 lb. of pasta and 10 – 12 meatballs. (About half of the recipe above, more or less) PLEASE BEWARE, THE SAUCE WILL SPATTER, KEEP IT ON LOW AND USE A LID AS A SHIELD. Now, that everything is cooked, it’s time to serve. I normally, place all the meal on the table, but in this case, I had everyone come up to me in the kitchen with their dishes, so I could have control over the portions. They were very big eaters, and I wanted to make sure, I had enough for everyone. With the holidays upon us, I hope, you will try these meatballs with the marinara sauce. Not only, they will look festive, but I can assure you, they will be the talk of the town. Happy Cooking and Happy Holidays From Gina’s Kitchen! Wine pairing suggestion: Chianti from the region of Tuscany. A luscious and widely popular wine made mostly from the red Sangiovese grapes. The traditional Bolognese sauce originated in Bologna, the capital of Emilia-Romagnia, a famous region in northern Italy, north of Florence. It is commonly called Ragu Bolognese. There are different versions, just like you will find different versions of tomato sauce and pizza. The Bolognese is always a meat-based sauce, usually veal, with some carrots, onions and tomato sauce. Milk or cream can also be added to give it a more authentic feel. 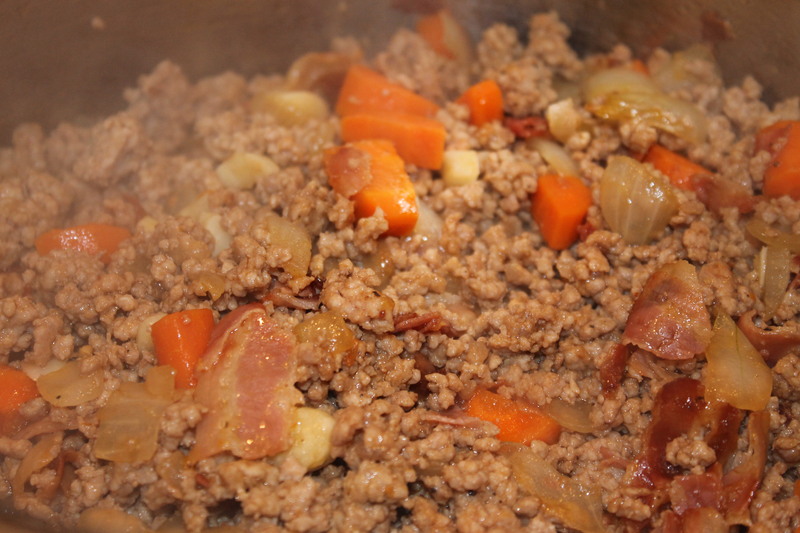 Today, I will share with you my version of the Bolognese sauce. It is quick, easy, delicious and you can double up the recipe to feed a large crowd. This recipe takes a minimum of 45 minutes to an hour to prepare, but you can extend the cooking up to 2 hours if you have the time. You will need to add water occasionally, and stir constantly to reduce the sauce. The flavors will be more infused and you will get a richer sauce. However, this recipe is a quicker version for today’s busy lives , and the best part of it, your loved ones will not know the difference. 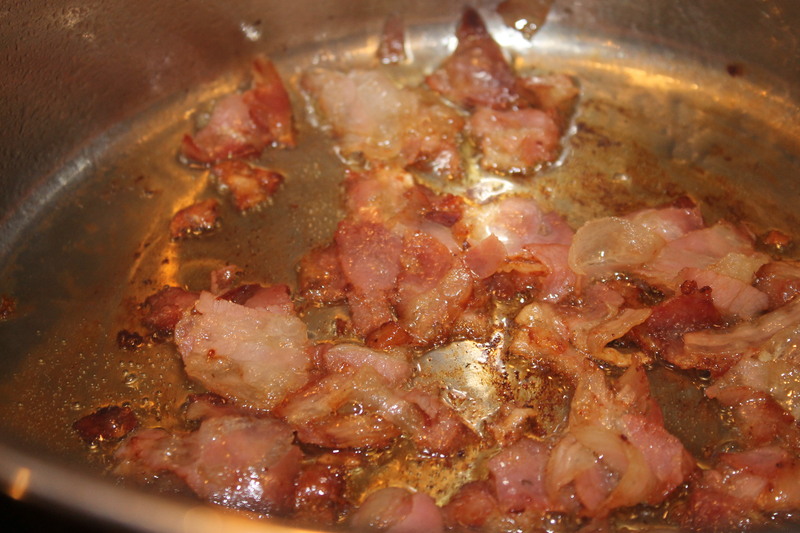 1) On medium-high heat, in a 6-8 quart stock pan, heat oil, brown pancetta, 2-3 minutes, remove and set aside. 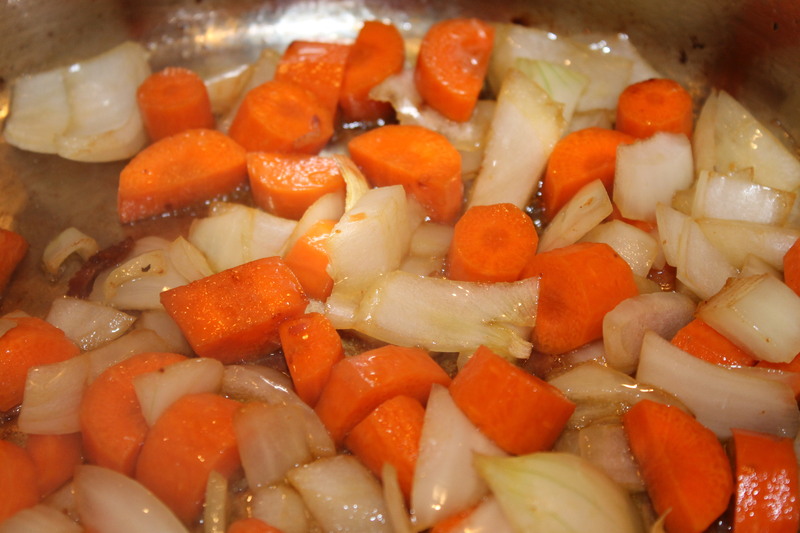 2) There will be some oil left in the pot, add the onions, carrots and garlic and sweat for about 2-3 minutes. 3) Add veal, brown for about 5 minutes by stirring occasionally, then add tomato paste, continue to brown until you get a nice caramelization. 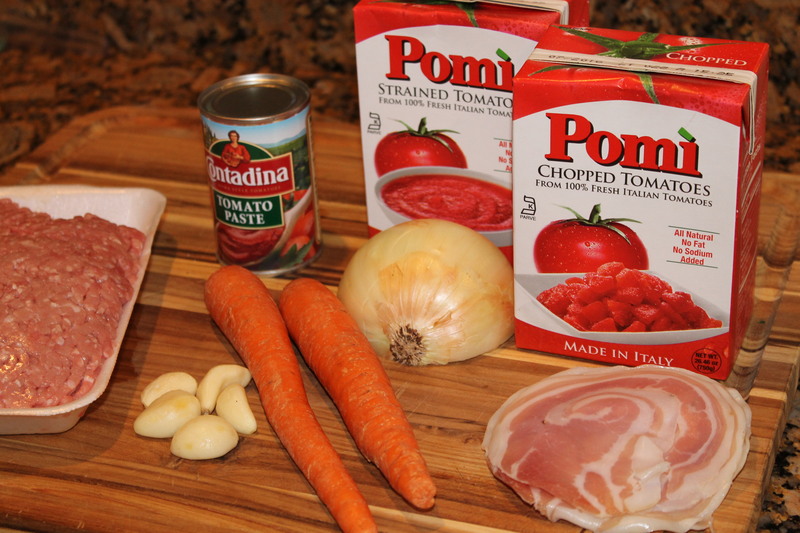 4) Add strained and chopped tomatoes, pancetta, 1/2 cup water, salt & pepper, oregano. Bring to a boil, cover and simmer for about 45 minutes on low heat. Stir occasionally to avoid the sauce from sticking to the bottom of the pot. If you feel like the sauce is too thick, add some pasta water. Remember, this is a meat sauce and it is supposed to be thick and not watery, therefore, use your judgement. 5) On another burner, get the water boiling for your pappardelle or whatever pasta you’re using, cook according to package directions. 6) Drain pasta, (save some water if you need it for the sauce) and pour it over the meat sauce. Make sure all the pasta is nicely coated and serve immediately. If you let it sit, the pasta will absorb all the sauce and it will become dry. Have the grated Parmigiano Reggiano at the table for individual use. If you don’t feel comfortable serving it this way, place pasta in bowls and pour sauce over each one. Sprinkle chopped parsley to garnish it and give it your personal touch. 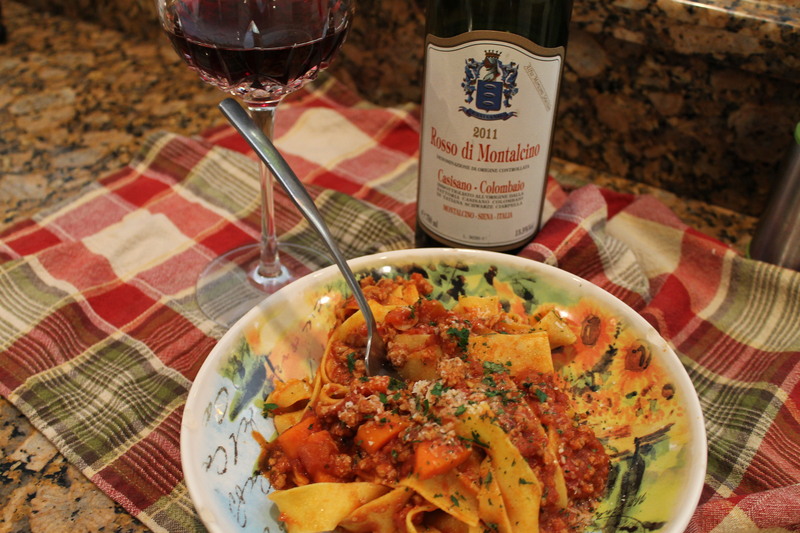 I paired this Bolognese with a delicious Rosso di Montalcino that went together magically. You certainly can use a nice Chianti instead, and it doesn’t have to be expensive. I promise you, your loved ones will thank you for this amazing dish. They will think you spend the entire day in the kitchen to create this delectable and hearty meal. With winter around the corner for some of you, this meat sauce will keep you warm and your belly satisfied. I hope you will try this recipe and have fun with it. Disclosure, I don’t get paid to advertise products on here, I use whatever brand I have in my pantry at the time of cooking. I like to change it up anyway and experiment. That’s what makes cooking fun and interesting (at least for me). Use whatever brand you prefer, be daring and have confidence. If you view cooking as a chore, it will be boring and uninteresting, but if you cook with passion, you will enjoy every step, and your meal will always be a success. I must admit, I enjoy getting compliments from my family because it encourages me to cook more for them. I’m not perfect and I’ve made a few mistakes in the kitchen, but I learned from them. The only way you’re gonna learn and create your signature dish is by experimenting. There is always room for improvement and I welcome feedback. I hope you have enjoyed today’s blog, and will give my recipe a try soon. Cheers and Happy Cooking from Gina’s Kitchen!